(CNSNews.com) - The U.S. merchandise trade deficit with the European Union set a record through May, hitting $65,839,100,000 through the first five months of 2018, according to data released this month by the Census Bureau. From January through May, says the Census Bureau, the United States exported $132,855,900,000 in goods to the European Union while importing $198,695,000,000 in goods from the European Union. That means the dollar value of the goods that the U.S. has bought from the EU so far this year is about 50 percent greater than the dollar value of the goods the EU has bought from the United States. 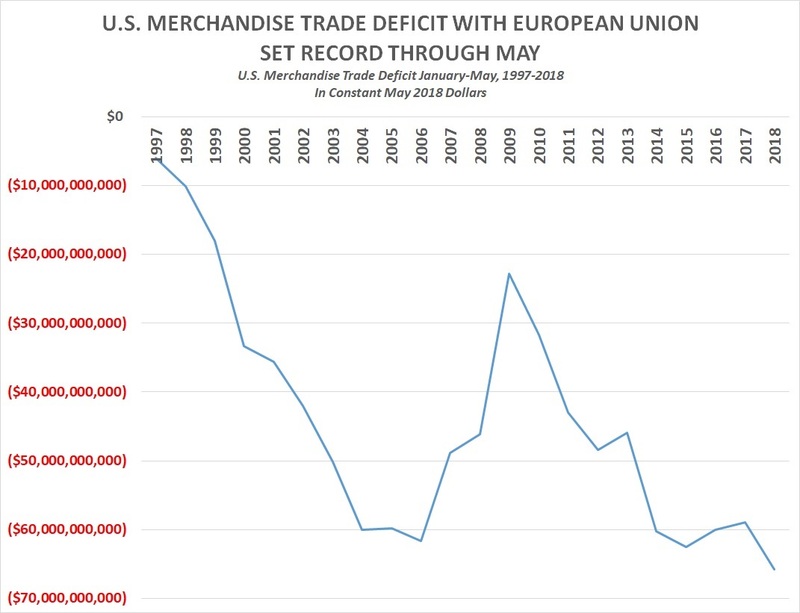 Prior to 2018, the largest merchandise trade deficit that the U.S. ran with the EU in the first five months of the year was in 2015, when it was $62,545,070,000 in constant May 2018 dollars (adjusted using the Bureau of Labor Statistics inflation calculator). The Census Bureau has posted U.S.-EU merchandise trade numbers going back to 1997. In every one of those years, the U.S. has run a trade deficit with the EU. However, that deficit has grown significantly over the years. In 1997, it was $16,964,600,000. By 2017, it had grown to $151,363,400,000. There are currently 28 nations in the EU and, individually, they have significantly different trade balances with the United States. 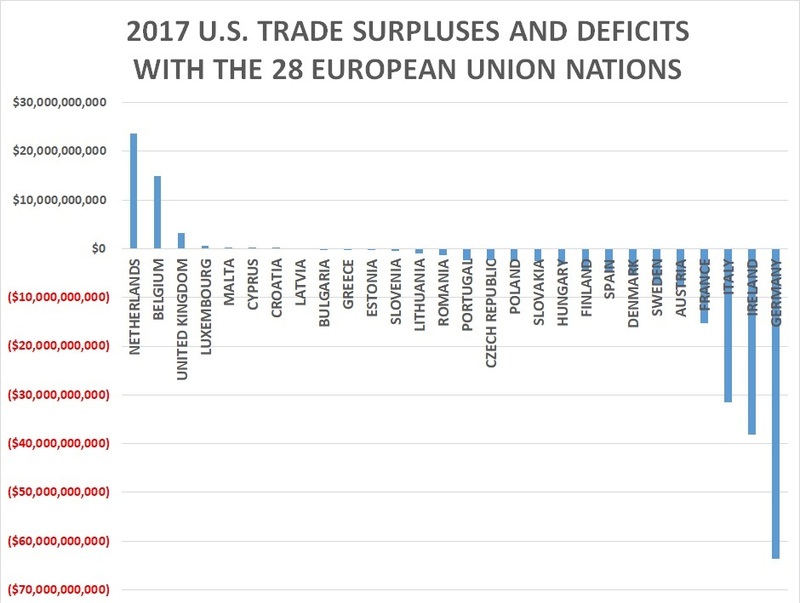 In 2017, the United States ran trade surpluses with seven of the EU countries. These included: Netherlands ($23,725,500,000); Belgium ($14,926,200,000); United Kingdom ($3,197,600,000); Luxembourg ($584,300,000); Malta ($130,300,000); Cyprus ($35,000,000); and Croatia ($11,500,000). Of the 21 EU countries that the U.S. ran merchandise trade deficits with in 2017, four stood out with particularly large deficits: Germany (-$68,678,500,000); Ireland (-$38,089,300,000); Italy (-$31,512,800,000); and France ($15,303,200,000). The top three imports the U.S. bought from Germany were passenger cars ($20,536,681,000); pharmaceutical preparations ($12,585,873,000,000); and industrial machines ($6,218,650,000). The top three exports the U.S. sold to Germany were civilian aircraft, engines, equipment and parts ($6,860,287,000); passenger cars ($6,045,826,000); and pharmaceutical preparations ($3,168,445,000). The top three imports the U.S. bought from Ireland were pharmaceuticals ($30,350,829,000); cell phones and other household goods ($4,310,552,000); and other foods ($2,287,969,000). The top three exports the U.S. sold to Ireland were pharmaceutical preparations ($3,497,556,000); civilian aircraft, engines, equipment and parts ($1,783,446,000); and chemicals-organic ($645,098,000). The top three imports the U.S. bought from Italy were pharmaceutical preparations ($5,733,866,000); passenger cars ($4,952,799,000); and industrial machines ($2,362,529,000). The top three exports the U.S. sold to Italy were pharmaceutical preparations ($3,752,031,000); crude oil ($1,001,021,000); and civilian aircraft, engines, equipment and parts ($933,284,000). The top three imports the U.S. bought from France were engines-civilian aircraft ($5,200,363,000); civilian aircraft ($4,850,114,000); and pharmaceutical preparations *$3,224,916,000).